Abraham Thornton better known to friends as “Abe” and to his family as “Ham” was born in Harris City Georgia on January 16, 1937 to Roland Thornton Sr. and Alberta Prather. Abraham grew up and worked in Harris City, where he also became a self-taught and proficient guitarist. In the summer of 1957, Abraham married Margaret Dianne Mobley. The following year, Abraham moved his family to Columbus, Ohio, where he was employed by the city as a construction worker. 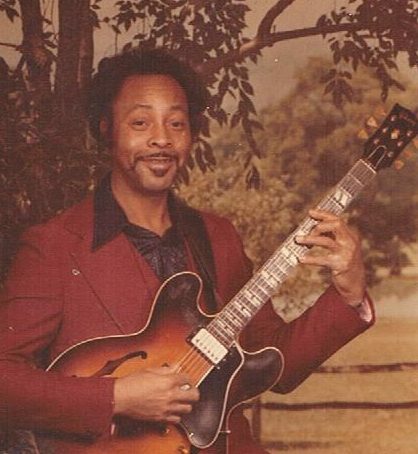 Back in the day, when house and club bands were popular, Abraham played the guitar and other instruments for several of these bands in and around the city. As a renouned guitarist, Abraham also had the opportunity to play with a national recording artist. Abraham and his brother’s, “June” and “Buddy” who were musicians as well, frequently held some of the best jam sessions in their mothers’ home. Abraham, his mother and brothers also had an inherited love of fishing that passes on to their children and grandchildren. Abraham was very close to his brothers and had a special bond with their children. Abraham is preceded in death by his parents, Roland Thornton Sr., Alberta and Lige Brewster; sons, Jerry and Danny; his brothers, Roland “June” Thornton Jr. and Elijah “Buddy” Brewster. Abraham leaves to continue on his children, Deborah Allen, Ricky Thornton, Abraham “Buster”Thornton., and Austin Johnson; grandchildren, Ryan Allen, Candace Allen, Marquisha Andrews and Erica Packer-Carver; sister-in-law, Margaret Stephens and a host of nieces , nephews and friends. Visitation 9am and Funeral 10am Saturday, March 10, 2018 at MARLAN J. GARY FUNERAL HOME, THE CHAPEL OF PEACE EAST, 5456 E. Livingston Ave. (one block east of Noe Bixby, turn north on Londsdale Rd.). Interment at Evergreen Burial Park. Dear Thornton family. I am so sorry to have read of the death of Abraham. Please accept my sincere condolences. I would like to share something that I have personally found to be comforting. It is found in the Bible at John 5:28, 29 and Revelation 21:4. (Please read) May God give you and your family comfort in His promise that soon we will never experience losing our loved ones in death and we will be able to see them again once they are resurrected. With deepest sympathy and warmth of heart. So very sorry for your loss. I hope your great memories ease your grief. To the Thornton’s, my Sister in Christ, Deborah Allen and family. A father may pass on, but, his thoughts, spirit, love, hopes, and dreams will always live on in you. We are saddened to learn about the loss of your loved one. Our Thoughts and Prayers are with you all.